Classic liver lobule in digestive system This model is based on the direction of blood flow. In sections, liver substructure exhibits a pattern of interlocking hexagons; each of these is a classic lobule. Whereas lobules in pigs are defined by a sheath of connective tissue, there is less connective tissue in humans and the lobule boundaries are indistinct. The boundaries of human lobules can be estimated, however, by noting the positions of the portal triads at the lobule periphery, the central vein at its center, and the alternating hepatocyte plates and sinusoids that lie between them. a. Portal triad. One triad occupies a potential space (portal space) at each of the 6 corners of the lobule. Each triad contains 3 main elements surrounded by connective tissue: a portal venule (a branch of the portal vein), a hepatic arteriole (a branch of the hepatic artery), and a bile ductule (a tributary of the larger bile ducts). A lymphatic vessel may also be seen. b. Central vein. A single vein marks the center of each lobule. This vessel is easily distinguished from those in the portal triad by its larger opening and lack of a connective tissue investment. c. Hepatocyte plates and hepatic sinusoids. Many such plates radiate from the central vein toward the lobule periphery (like the spokes of a wheel). 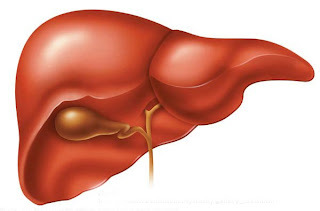 The plates are separated by hepatic sinusoids, which receive blood from the vessels in the triads, converging on the lobule center to empty directly into the central vein.